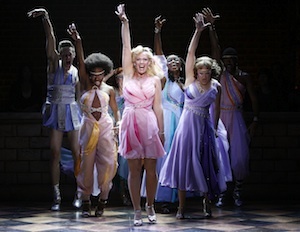 It’s hard to write a review of Xanadu The Musical with a straight face. Part of me is thinking, “Really, you’re going to pick apart a musical based on one of the cheesier films from the 80’s?” and in truth there will be some people who click off their brain and just enjoy the brief 90 minute staging of this kitschy musical no matter what faults it has, and that’s fine. The problem with Xanadu The Musical is that it actually far, far worse than the movie it’s based on. Adapted from the 1980 film with Olivia Newton-John, Gene Kelly and Michael Beck, Xanadu is a fantastical story of a Greek demi-god sent to Earth to be a muse for a struggling artist. In the process she breaks some cardinal rules, including falling in love and getting involved with the creative process itself. Peppered throughout the story are some classic songs from the film including “Magic“, “Suddenly“, “I’m Alive” and the theme song “Xanadu“. None of these songs are pure classics in their own right, but they do really capture some of the delicious elements that make the 80’s so fun to wax nostalgic over. Musically this gives Xanadu a fairly solid base. Like Mama Mia, there’s enough of a musical foundation for a fun night of musical theater. Unfortunately the music is so subverted in favor of cheap gags and poor staging that it’s hard to genuinely enjoy it. Elizabeth Stanley, who performs the lead role, has a fantastic voice, similar in tone to Oliva Newton-John, with a depth and breadth that truly fills the auditorium. But she so hams it up while singing that it’s really difficult to enjoy her genuine talent. When she isn’t singing, Elizabeth Stanley’s performance is really subpar. For part of the show she sports an absolutely horrid Australian accent. The accent is yet another aspect of the show played as a gag, but it’s so poorly executed it’s painful. Stanley’s co-star Max Von Esson, who plays Sonny Malone, has such a small stage presence that he’s absolutely eclipsed by Stanley. Von Esson reminds me of the kind of performer you see on a cruise ship or at Disneyland. He awkwardly hams it up and then completely under delivers when it comes time to really sing. Von Esson even comes up short in terms of skating – in the grand finale he doesn’t even skate. With all the talent out there (including the cast-offs from all the seasons of American Idol), it’s hard to believe they couldn’t find a better performer to play Sonny. Of all the other cast members the only other real highlight of the show is Larry Marshall, who has the unenviable task of performing a role originated by the great Gene Kelly. Marshall is one of the only genuinely talented and well rounded performers on stage. He seems to be the only one to be able to balance both the humor and the narrative of the musical and both sings and acts wonderfully. One of the biggest problems with Xanadu The Musical is that it seems to have a fairly strong disdain for the time period which the film and story are set in. Throughout the show the 80’s are often referred to as ‘culturally devoid’ and references to most of the 80’s things are more pejorative than positive. The musical also seems to have a disdain for the very artform of the musical itself. It constantly pokes fun and commentates on the very institution of art that it is. This creates an undertone to the piece which is far from celebratory. Rather than trying to be so self referential, Xanadu had an amazing opportunity to celebrate the absolute over-the-top aspects of the time period and musical theater art form; instead, it seems more interested in bashing it. The staging for Xanadu The Musical is an absolute mess. Rather than embracing the crazy and wonderful styles of the 80’s the stage looks more like a cheap, dull ampithere with columns and risers that accommodate on-stage seating. Having audience members sit on the stage has become fashionable after plays like The 25th Annual Putnam County Spelling Bee and Spring Awakening. In both those productions the placement of these audience members served a purpose. Here it’s just another element tacked on to make the show more ‘hip’. These audience members are out of place in this period piece and are only really there to help make the stark staging feel less empty. My absolute biggest gripe with Xanadu The Musical is how nearly every moment of the show is played for laughs. The show is littered with so many cheap jokes and gags that it leaves very little room for anything else. This completely subverts the characters and the narrative so it becomes extremely difficult to care about anyone or anything in the show. I think it’s possible to play Xanadu over the top and still have some genuine moments between characters. Ultimately Xanadu is one huge opportunity lost. The original movie had an element of huge spectacle which gets completely lost in the adaptation to stage. Xanadu could have been a flamboyant and unrestrained celebration of an era that wasn’t ever aware how ‘far out’ it really was. But, I don’t think the creative team behind Xanadu genuinely loves the material or the era they’re presenting, I think they saw a good opportunity to mount a Broadway production that would attract a 30something audience who would place very little demands on the play and would appreciate its short running time. The onstage audience is used to sort of represent Greek theatre while also creating the general impression of a skating rink and allowing for audience interaction. I absolutely loved this tour of Xanadu. Having said that, I think that it is still problematic in the sense of the audience that it reaches. A show like Xanadu requires a kind of small theatre intimacy that allows everyone to feel in on the joke. This can get lost in a huge 3000 seat auditorium in which the people with the best seats are typically senior citizens with season subscriptions. They often times tend to be less responsive. Not everybody gets it. I think think that you, for example, took the whole thing far too seriously.